Like a stenographer's pad, the Compass is portable-meant to fit in one hand-and the pages flip upward rather than sideways (the spine's at the top of the book). The Compass is loaded with our high-quality 100 GSM acid-free, fine-grain paper bearing our signature page layouts-and it's protected by a hardcover that's both stylish and sturdy. But it gets better, because this ain't your mama's notepad (or even a fancy remake of it). First: the Compass has precision-cut perforated pages. So if you're done with a page, just pull it out! And notice that it comes out CLEAN... no mess, no stress, no papery ends. Second: the Compass is reversible! Open it from the front and you've got the lined indentation rule ready-but open it from the back and you'll see a dot grid in ready position. As always, we account for both disciplines of an idea. LAY-FLAT DESIGN: Built using a premium binding that ensures every notebook lays flat, for easy writing no matter what page you're on. REVERSIBLE LAYOUT: Two page layouts in a single notebook! Front pages have our unique Indentation Rule for structured notes, while back pages have a dot grid for sketches and drawings. PRECISION-CUT PERFORATION: Each page can be torn out easily and cleanly, so that you can easily share your brilliant ideas. 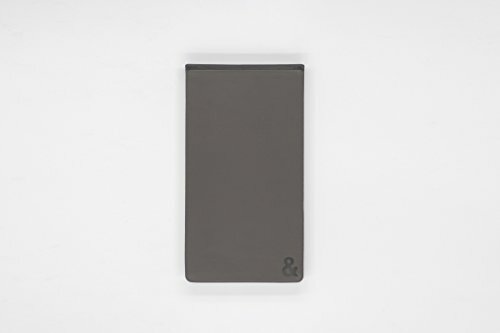 THICK DURABLE PAGES: All 192 pages in the Monolith are made from 100GSM, acid-free, fine grain paper. These books are made to last. SIZE: At 4.4" by 7.7", the Compass is the perfect travel companion, or can sit seamlessly on your desk. If you have any questions about this product by Code&Quill, contact us by completing and submitting the form below. If you are looking for a specif part number, please include it with your message.